Muammar Gaddafi (1942–2011) had been ruling Libya since the 1969 overthrow of the Libyan monarchy. Gaddafi made it his mission to bring socialism to Libya by dismantling the wealthy, educated, conservative class that had ruled Libya during the monarchy. He increased Libyan oil production and introduced sharia (the religious law of Islam) into the legal system. He worked to suppress tribal affiliations of the people to create a unified Libyan identity. Upon taking control of Libya, Gaddafi was quick to criticize the United States for its support of Israel. Despite this, the U.S and United Kingdom extended diplomacy to Gaddafi. But Gaddafi refused their support and instead considered both the U.S. and U.K. to be imperialists (and, to a lesser extent, France and the Soviet Union). Determined to display national sovereignty and to keep Libya free of foreign colonial influences, Gaddafi demanded that the U.S. and U.K. remove their military bases from Libya. He also expelled tens of thousands of Italians living in Libya, and a smaller number of Jews. 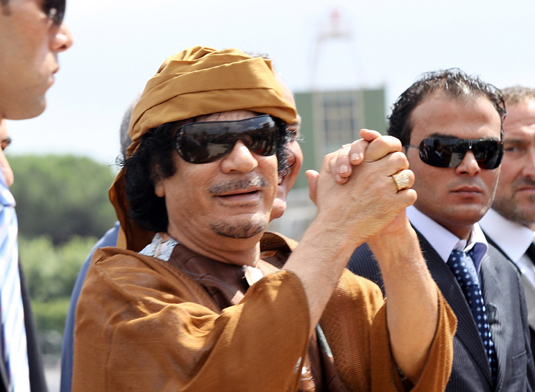 Gaddafi was not quick to make allies — in fact, he did quite the opposite. In 1973, after Israel shot down a Libyan airliner that strayed from Egyptian to Israeli airspace, Gaddafi was infuriated with Egypt (Libya’s eastern neighbor) for first allowing the incident to happen and then for refusing to retaliate by sinking a British cruise ship that was chartered by American Jews. He was further offended when Egypt and Syria planned the Yom Kippur War against Israel without consulting him. He openly sponsored an attempt to overthrow the ruler of Sudan, a nation that borders Libya in the southeast; and he invaded Chad (Libya’s neighbor to the south) to fleece the nation of uranium. Libya had conflicts with even more of its neighbors, including Morocco and Tunisia. In 1981, new U.S. President Ronald Reagan declared Gaddafi the “mad dog of the Middle East.” Reagan erroneously considered Gaddafi a pawn of the Soviet Union. In truth, the Soviets were just as wary of Gaddafi, but Gaddafi antagonized Reagan by visiting Moscow and threatening to join the Warsaw Pact. Reagan closed the Libyan embassy in Washington, implemented an embargo of Libyan oil, and prohibited U.S. companies from doing business in Libya. The U.S. and Libyan militaries had several small skirmishes as Reagan ordered the U.S. military to perform exercises in the Gulf of Sirte (or Sidra), just off the coast of Libya in the Mediterranean Sea. Finally, on April 15, 1986, the U.S. military conducted a series of air strikes on Libya, bombing military installations, killing around 100 Libyans, and targeting Gaddafi’s home — which injured two of his sons. The U.S. was condemned internationally, but Reagan was lauded at home. Meanwhile, the incident caused Arab nations to become sympathetic to Gaddafi. In 1988, Pan Am Flight 103 was blown up over Lockerbie in Scotland, killing 259 passengers. British investigators identified two Libyans as the chief suspects and demanded that Libya turn them over. Gaddafi refused, causing the United Nations to impose economic sanctions against Libya which deeply hurt the Libyan economy. Many African states opposed the U.N. sanctions, which were finally lifted in 1998 when Gaddafi agreed to allow South African president Nelson Mandela to oversee the extradition of the Pan Am bombing suspects to the Netherlands. In the early 2000s, Gaddafi seemed to soften. He became increasingly interested in unifying the nations of Africa. Gaddafi became a champion for the African Union and proposed a single currency, a single military, and a single passport for the African continent. Libya also began negotiations with the British to normalize relations between the two nations. Gaddafi condemned the September 11 attacks on the U.S. and later, influenced by the U.S.-Iraq War, he decommissioned Libya’s chemical and nuclear weapons programs. This moved the U.S. to remove Libya from its list of state sponsors of terrorism. Joining Venezuelan President Hugo Chávez in vowing to keep imperialists from infiltrating Africa and Latin America. Proposing the establishment of a South Atlantic Treaty Organization to rival NATO. Addressing the United Nations General Assembly in New York for the first time (in 2009), using his speech to condemn Western aggression. He was obsessed with his image and changed clothes multiple times a day (his garb varying from bright frocks that made him look like the folktale character Ali Baba to big sunglasses and cotton pants that made him look like a rock star). He was notoriously afraid of heights, refusing to climb more than 35 steps in any building. He was never far from his four beautiful Ukrainian nurses, who called him “papika” (Russian for “little father”). He retained an all-female team of security guards, approximately 350 in total, and all rumored to be virgins. When traveling in Libya or abroad, he packed a large Bedouin tent and insisted that diplomats meet him in it instead of inside official government buildings. He was obsessed with flamenco dancing. To read about how Libyans finally rid themselves of the Gaddafi regime, see the article The Libyan Civil War.